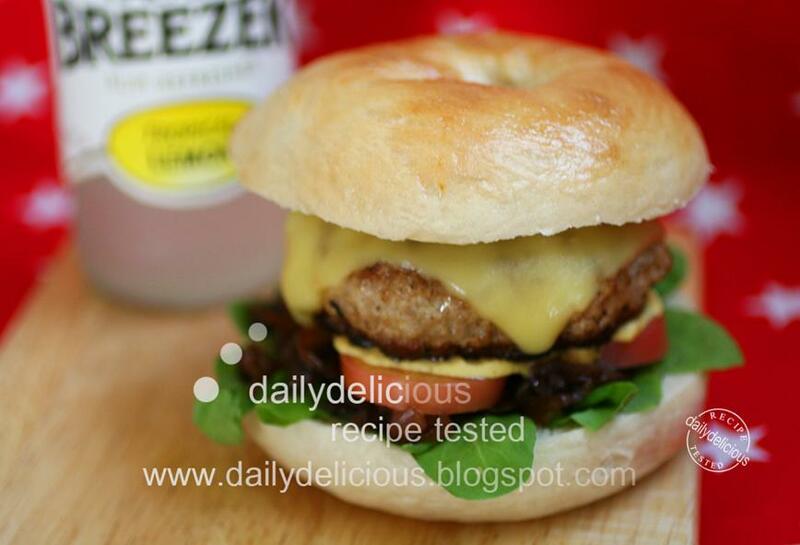 dailydelicious: Chicken Farm Baker's Project 22: In love with Bagels, Bagel Burgers with caramelized onion. Chicken Farm Baker's Project 22: In love with Bagels, Bagel Burgers with caramelized onion. The time for the Chicken Farm Baker Project again, this month Jib, want all of us to play with the bagel, by baking it and turn it into something delicious, ^ ^. I made the bagel before, but the first time was not impressive, my first bagel was too chewy, a bit hard and very dense, after that I don't want to make it again, -*-. So, when I know that I have to make the bagel for this month project, I feel nervous, haha, and I think that I want to make it better this time. I choose the recipe from the book and adapt it to make it softer by adding some of the water and honey. And, yes!, this time my bagel is still chewy but not too much, and softer, most of all it makes me feel a lot better with homemade bagel, ^ ^. I think about what I want to turn my bagel into, luckily I have a hamburger in the fridge (I made it a week ago, ^ ^, then freeze it, it's a fast dinner, haha), so, when I got both delicious bread (My Bagel, wow) and delicious hamburger patties, the best thing that they should turn it to is the Bagel burgers. 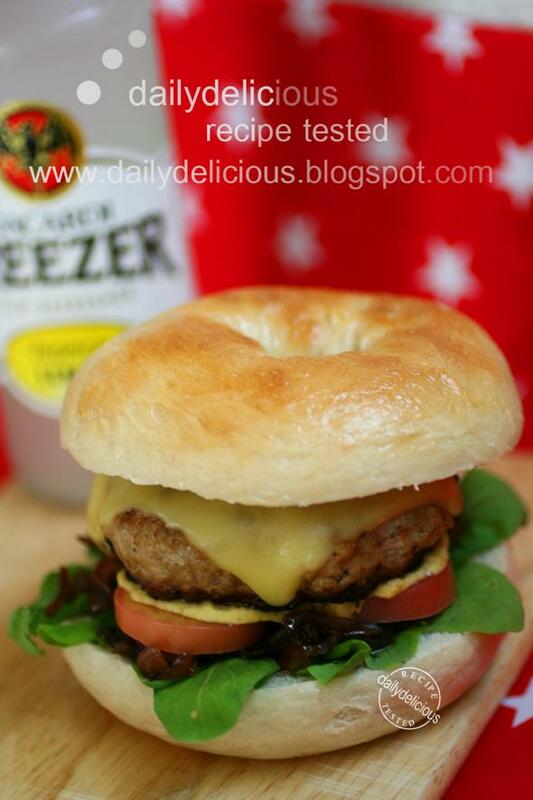 I split the bagel in half, toast it a bit then pile up with rocket, caramelized onion, tomato, then squeeze the Dijon mustard on top and finish my delicious creation with the hamburger patty and cheese. 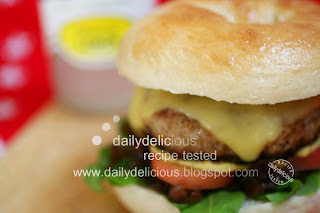 The chewy bread make the eating this burger more delicious, I suggest serving this yummy burger with cold beer or if you like I having mine with the Barcardi, ^ ^. Mix the water and the honey together. Put the bread flour and salt in a bowl, whisk to combine, add the sugar and yeast. Pour the water mixture into the bowl. Take the dough out of the bowl and knead. Knead by using the heel of your hands to compress and push the dough away from you, then fold it back over itself (see the picture here). Until all the dough are moisten. Give the dough a little turn and repeat. Put the weight of your body into the motion and get into a rhythm. Keep folding over and compressing the dough. Knead for 10-15 minutes or until the dough is soft, pliable, smooth and slightly shiny, almost satiny, the dough will stop sticking to your hand. Cover the bowl with a tea towel or cover with the plastic bag and leave the dough to prove for about 10 minutes. 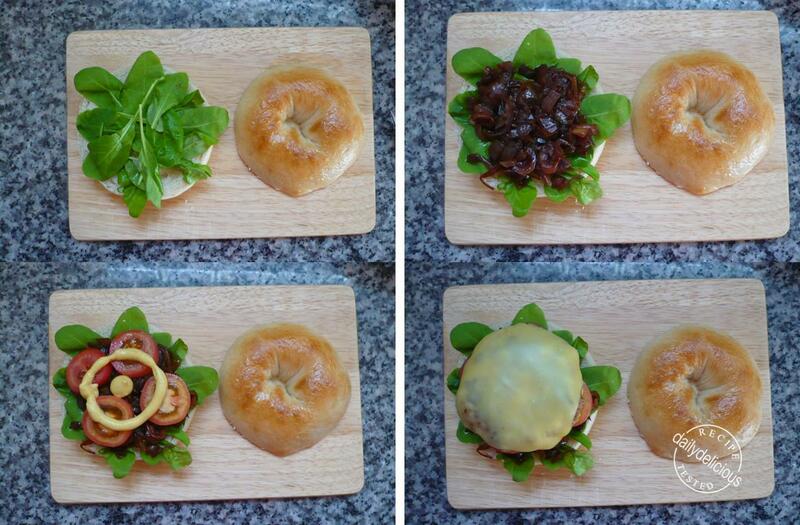 Prepare the baking sheet by lining with the baking paper or silpat (Note: the bagel quite sticky). 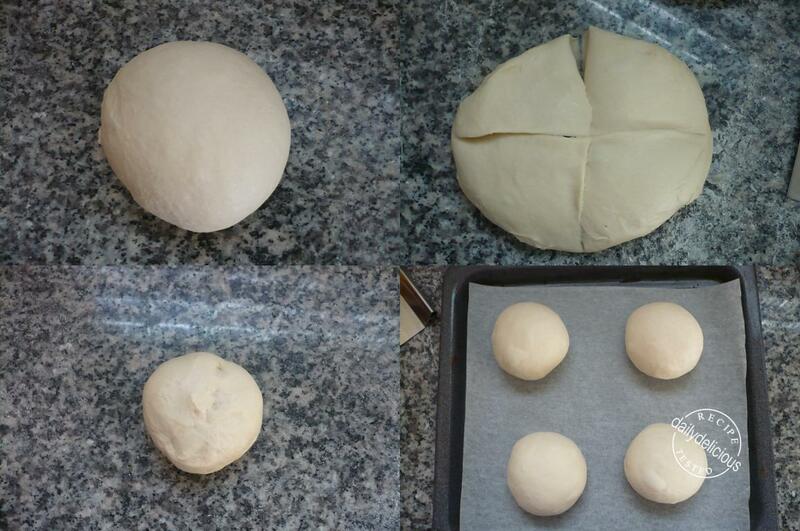 Gently press down the dough and cut the dough into 4 pieces, let the dough rest for 10 minutes. 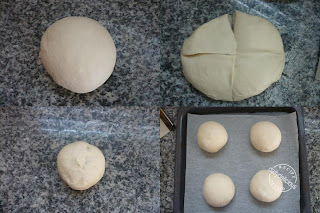 Use a rolling pin to roll the dough into a circle. 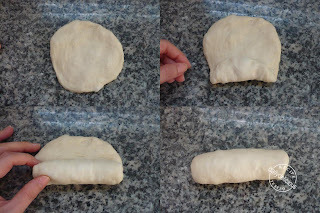 Fold the dough and roll into a small cylinder. Roll the cylinder into 20 cm long. 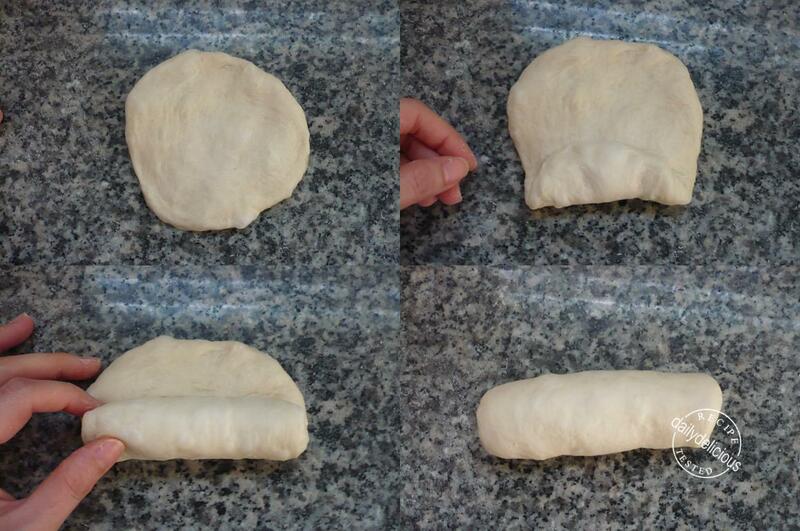 Press one end of the dough, join the ends and place fingers through the hole and roll the ends together. Place on a lightly greased surface, cover with a clean cloth, and let rest until risen but not doubled in a draft-free spot, 20 to 30 minutes. In a medium, heavy pot, bring 2 cups of water and the honey to a boil. In batches, add the bagels to the water and boil, turning, for 15 seconds. Flip bagels onto the prepared sheet pan. Brush the bagel with egg white. Note: in the picture I make 2 batches of the hamburger. Heat 15g of the butter in the frying pan, add the chopped onion into the pan, and sweat over low heat until soft but not colored. In a bowl, mix the ground meat, egg, bread crumb, onion, and milk, then season with salt pepper and nutmeg. Put the rest of the butter in the pan. 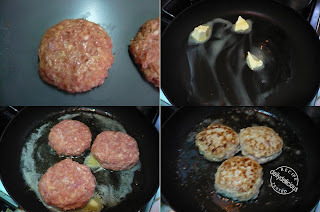 Place patties on the pan, and cook 5 minutes per side, or until well done. 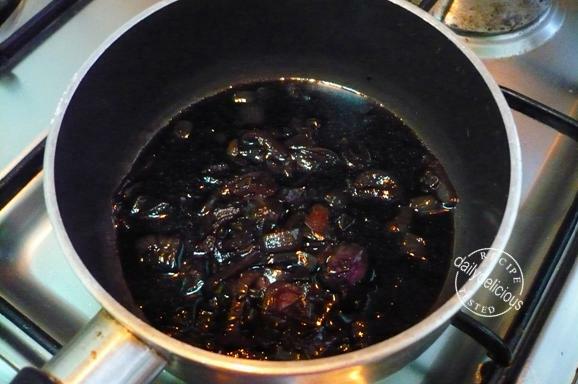 Heat the oil in a frying pan over a low to medium heat. Add the onions and sweat over a low heat until soft but not colored. Turn up the heat and allow the onions to become caramelized and start to brown. Add the vinegar and the sugar, stir gently and continue to cook over a medium heat, so that the vinegar begins to reduce. Let the mixture boil until the vinegar has become thick and sticky and coats the onion. Slice the bagel and toast for 5 minutes, (or more ^ ^). Place the rocket, caramelized onion, sliced tomatoes and brush (or squeeze) the mustard on top. Finish with the hamburger and cheese and top with the bread. Serve warm with everything you like, for me I serve my with a bottle of Bacardi Breezer , haha. 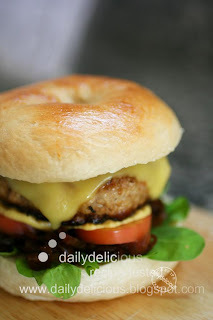 Chicken Farm Baker's Project 22: In love with Bagels, Bagel Burgers!